Marketing IT Offerings: Ensure your messaging is on target with helping government improve performance, customer experience and operational costs. Traditional commercial tactics do not always translate seamlessly into the public sector market. Aligning your message to your customer’s mission needs and outcomes, marketing to multiple agency stakeholders (from technologists to procurement professionals) and transitioning your position from vendor to partner/educator can significantly improve the strength of your marketing and messaging to this niche market. Lou Anne Brossman and Steve Watkins from Government Marketing University interview marketing executives Liz Anthony (ViON Corporation), Aaron Heffron (Market Connections) and Milo Speranzo (Dell EMC) about effectively marketing IT service offerings in the public sector. 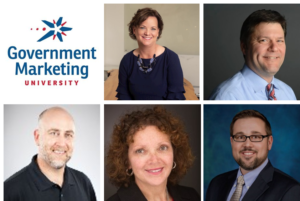 This discussion provides fellow government marketers insights and best practices for the evolving government IT landscape. Your marketing collateral should showcase BOTH your services AND your product offerings. Federal marketing is evolving from product to solution focus. Your marketing should focus on how you can help your customers meet their mission, not their bottom line. Educating your customer is essential to solution marketing (and selling.) Help them understand all aspects of the solution to their current problems, and review solutions to the problems they haven’t even realized they have yet. Newer “As A Service” models require multiple messages. Multiple audiences play a role including technologists, compliance and procurement professionals. Do not treat the government as its own vertical, but as a robust economy with its own verticals. Customize your marketing to different verticals within the public sector economy you are going for (state, local, federal, agency). If you are new to government or vertical, leverage any name brand equity you may have in the commercial space, across other verticals or even other products to get a leg up in the market. It’s not completely necessary to run away from your established commercial roots. Consider the future buyers in the public sector audience and how they gather information – generational turnover in leadership positions requires a trusted partner to help guide them. With so many events and media outlets in the public sector space, be strategic on where you spend valuable time, energy and resources. Triangulate where your customer and their mission aligns with your offerings and solutions and place your focus there. Look at opportunities to partner with associations and volunteer opportunities in areas of focus for your government customers. Utilize great free resources such as fbo.gov, performance.gov, fpds.gov and other government sites.